Deadly Friend is Craven’s entry into the Frankenstein-movie canon. Paul is a teenage genius who’s just moved into town to attend the local Polytech University on a special scholarship, intended to fund his research and ongoing development of artificial intelligence, currently in the form of BB, a large yellow robot that Paul describes as “smarter than humans.” A romance quickly flourishes between Paul and his new neighbor Sam, who tries to hide the telltale signs of abuse by her alcoholic father; when he shoves her down the stairs in a drunken rage, inadvertently putting her into a coma, Paul decides to use his knowledge of neuroscience and BB’s “brain chip” to save her – but with bizarre, deadly consequences. Deadly Friend is a perfect example of Craven’s often contradictory impulses as storyteller and craftsman, similarly on view in films like The People Under the Stairs or Stranger in Our House. While he clearly excelled at developing suspense, scares, and the use of practical effects, his films often seem intended for a younger audience, somewhat awkwardly toeing the line between preteen drama and adult horror – and it’s ultimately a testament to his talent that these films can, and often do, work well. Craven initially developed Deadly Friend to be a PG-rated, “dark romance;” he felt that the scariest monster would – and should – be Sam’s father, a monster in average suburban clothes. 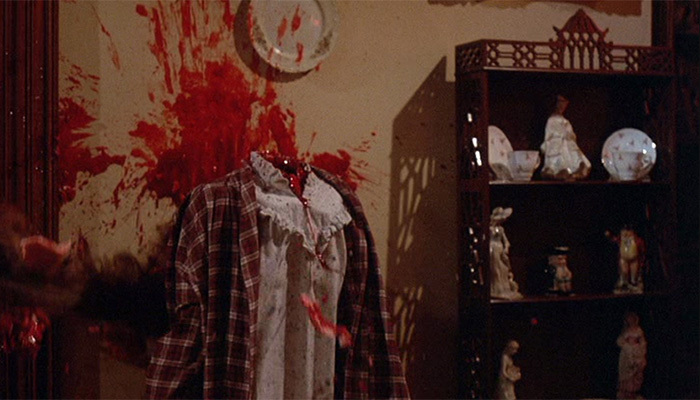 Apparently Warner Bros. felt that the film needed to follow in the footsteps of Craven’s groundbreakingly successful A Nightmare on Elm Street and insisted on the addition of some gory death scenes to draw the same crowds. And it’s apparent that these little bits of horror are late-stage additions; they’re short and disjointed enough to stand out as interruptions in the dramatic tone of the film. But the thing is, they’re also really good. For example, in one scene, living-dead Sam takes revenge on their nasty neighbor (played by Anne Ramsey, or Ma Fratelli of The Goonies as most will recognize her) with a basketball thrown with superhuman strength. The face explosion and headless-body-dance that follow are absolute must-sees. Then there’s the bizarre coda involving a Terminator 2-style skin melt to robot sequence that while inexplicable in terms of the rest of the film’s narrative is nasty and effective. I don’t know what the hell it’s doing there, but I love it. And that applies to the rest of the film as well: it’s a mishmash of tones and emotional cues that somehow really works. Though Craven basically disowned Deadly Friend, I’m hoping to see it celebrated alongside the rest of his brilliant output. You can find Deadly Friend streaming free on Dailymotion. This entry was posted in Retrospectives and tagged Deadly Friend, Horror, The Deepest Cuts, Wes Craven. Bookmark the permalink.